8 How Do These Link to Low Back Pain? The following wiki page will aim to investigate the body’s anatomical slings and the ways in which a dysfunction could potentially result in lower back pain. We will be discussing the stability of the lumbo-pelvic complex and the systems (both local and global) which govern it. We will also attempt to present the literature available in this underreported, but essential area of dynamic stability. A detailed breakdown will then follow, that will include: a background to myofascial slings; an analysis of the individual sling systems; and how these could possibly relate to low back pain. Dr Joseph Shepherd is an expert and module lead lecturer in the field of dynamic global movement, and strength and conditioning. In the following video, he introduces the concept of viewing the body as a whole, and the implications that a limited approach may have.The authors of this article hope that the information on this page helps the reader better understand stability, and the way that it may influence a more comprehensive approach to instability and lower back pain. As human beings our bodies are subject to constantly changing demands placed upon us by the external environment. Therefore, the ability to adapt our bodies in order to cope with these varying stresses is vital in order to protect internal structures. The lumbo-pelvic complex plays a key role in distributing load and maintaining stability during movement and changes in external demands. The primary function of this unit is to allow the transfer of forces safely in order to allow complex movement, without injury, and whilst facilitating efficient respiratory function. It helps aid the prevention of injury to vital structures such as the spinal cord, as well as the bony and soft tissue structures of the area. When investigated in an in-vitro environment, it has been estimated that the human spine can withhold loads of approximately 90N before buckling. However, research suggests that in functioning human beings this load can reach up to 1500N. 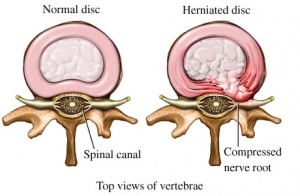 This indicates a heavy dependence upon other structures in order to provide the stability required to cope with the forces that the spine is subjected to in reality. The relationship between the sacrum, pelvis and lumbar spine, alongside their surrounding structures, is fundamental to stability. The contribution of the design and structure of pelvic anatomy to stability is known as sacroiliac joint form closure. As alluded to before, the bony structure of the spine and pelvis alone is insufficient to deal with the forces the body is exposed to. Therefore, other structures such as ligaments, muscles, and fascia are required to distribute forces across the region. This is known as force closure of the sacroiliac joint . In spite of this theory, there is still discrepancy within the literature as to the contributors to spinal stability. A core stabilisation approach is commonly used by clinicians in order to treat pain in the spinal region. 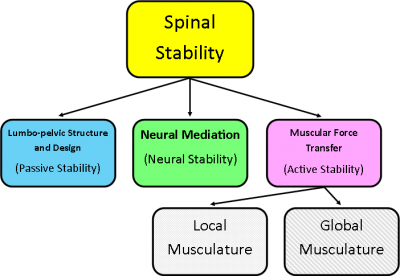 As purported by Norris (2008), this perspective focuses more on intrinsic mono or bi-articular muscles as primary stabilisers of the spine, and pays little attention to global systems. A significantly broader approach is becoming increasingly common within the literature. This perspective considers the force closure stability mechanism as a complex system of selective co-contraction, between the deep and superficial muscles of the lumbo-pelvic region. It is believed that the term ‘control’ holds greater aptitude than ‘stability’, as it pertains to the constantly changing contribution of intrinsic and extrinsic muscles, and the ongoing mediation by the central nervous system (CNS). It is believed that in order to achieve functional control, the CNS has the ability to dampen some systems whilst exciting others; this may in fact result in reduced ‘stability’ in sacrifice for greater mobility. The CNS has multiple strategies at its disposal, and utilises these depending upon the quantity of stabilisation required, the predictability of movement, and the risk to the bodily structures. Work carried out by Richardson (2002) upon subjects who carried out sacroiliac stability exercises in a static position, found a lower sacroiliac joint (SIJ) laxity when intrinsic muscles were contracted, compared to more superficial muscles. This demonstrates that different roles are played by the varying muscular groups in order to achieve optimal control. Another example of this is the recruitment of the intrinsic muscles when anticipating movement. The slow-twitch, type one fibres in the multifidus, for example, will be stimulated by the CNS to contract when a change in posture is predicted. With this harmony of stability control a different approach can be taken when viewing the more extrinsic and global musculature of the lumbo-pelvic region, and this will be explored in the further in the subsequent sections. Serge Gracovetsky (1988), offered a theory of human motion which he called “The Spinal Engine” stating that quadruple amputees could “walk” on the bones at the base of their pelvises. He reasoned that spinal rotation and the muscle systems around the lumbo-pelvic region might be at the base of human movement. Thus, the efficiency and harmony of these muscle systems is very significant, as the limbs merely amplify movement that originates in the musculature of the spine and trunk. It has since been proposed and developed from this, by the likes of Andry Vleeming, Diane Lee, and Thomas Myers, that anatomy slings are a large part of these systems and our ability to generate efficient dynamic movement. As noted above, the superficial muscle activity should occur in synergy with the deep muscles, which is an integral part of dynamic movement. Anatomy slings can be otherwise known as the ‘myofascial slings’ and relate very closely to superficial muscle activity. Anatomy slings were first described by Vleeming, and the term ‘myofascial’ relates to the structures involved within a sling. Anatomy slings aren’t comprised by only one type of tissue; they are comprised of muscles, fascia and ligaments all working together to create stability and mobility (Vleeming et al 1993). Is critical to understand how they connect and function together. A muscle contraction produces a force that spreads beyond the origin and insertion of the active muscle. These forces are transmitted through structures within an anatomical sling, allowing forces to be produced quite distant from the origin of the initial muscle contraction; this can be referred to as a force vector. The muscles depicted within a myofascial sling are connected via facia to produce these force vectors that assist in the transfer of load within the pelvis and lumbar spine. These muscles within a myofascial sling may overlap and interconnect with other slings depending on the change in force vectors needed for a competent dynamic movement. When the force vectors are balanced, they provide optimal alignment of the bones and joints throughout dynamic movement. In contrast, imbalanced force vectors resulting from altered tension in the myofascial slings, can create malalignment and potentially contribute to loss of stability during static or dynamic tasks. The body is a complex system made up of many of these anatomical slings. As explained above, when the slings are working efficiently. They also help us move better, produce more force, and create more speed. However, when there is a weak component in the sling, clinicians don’t often address the slings, but rather the muscles individually and a person’s general movement pattern. An understanding of this is becoming increasingly important for clinicians failing to recognise the integral role of anatomy slings. In physiotherapist Diane Lee’s book, The Pelvic Girdle (2011), she discusses four important sling systems that work together for load transfer through the pelvic/ lumbar region. A “hole” or weakness of a component in any of these systems can create dysfunction and resulting poor performance and/or injury. The anterior oblique system (AOS) consists of the external oblique and internal oblique, connecting with contralateral adductor muscles via the adductor-abdominal fascia (See image A1 - red arrows). When this group of muscles contract together, it provides stability by acting like an abdominal binder, compressing the entire pelvic girdle, resulting in force closure of the symphysis pubis. When working interchangeably with the other AOS (See image A1 - yellow arrows), and in harmony with other slings, it will also cause relative movement of the pelvis. Image A1: The two Anterior Oblique Systems supporting the pelvis, as described by Vleeming and Lee. When walking, the AOS is important in providing stability. The adductors work in harmony with the internal oblique and opposite external oblique muscles, utilising a balance of force vectors to both stabilise the body on top of the stance leg and to rotate the pelvis forward. This is to position the pelvis and hip optimally for the succeeding heel-strike (See image A2). Basmajian (1967) concluded this when looking at the EMG recordings of the oblique abdominals during gait. It was clear in his findings that both sets of muscles, together, contribute to stability at the initiation of the stance phase of gait, as well as to rotating the pelvis and pulling the leg through during the swing phase. His findings also supported that as the speed of walking progresses to running, activation of the anterior oblique system becomes more prominent. The opposite AOS will be working in reciprocity, lengthening whilst the on shown in Image A2 is shortening in order to allow the hip to extend back, with control. The demands on the AOS are great in multi-directional sports such as tennis, soccer, football, basketball, rugby and hockey. In such sporting environments, the AOS must not only contribute to accelerating the body, but also to rotating and decelerating it during the change of direction. Accelerating, decelerating and changing directions are all activities that result in immediate pain in the presence of both abdominal and groin strains or tears, which strongly suggests a link within the AOS and its function. Image A2: To show the adductors working in harmony with the internal oblique and opposite external oblique abdominal muscles to support the pelvis when walking. Static resistance and isometric training like planks and crunches can be used to strengthen isolated parts of the AOS, much like strengthening specific body parts. This is beneficial when addressing a specific dysfunction within an anatomy sling that has been identified. However, dynamic training utilises whole anatomy slings. This is more appropriate, allowing us to cope with stresses and demands placed upon us throughout dynamic movements. An example of more dynamic exercises incorporating the AOS are Russian twists and hill sprints(Page et al, 2010). The AOS can be trained and appreciated when running in sand due to the fact that sand gives way during the initiation of the stance and following contact phases of gait. The ground reaction force that aids dynamic movement is disrupted, resulting in poor use of the thoracolumbar fascia and posterior systems. This increases activation of the AOS to compensate for the lost kinetic potential and muscular energy of the posterior systems, in turn, making it a good way to train the AOS. It is important to know that this increased work may result in injury, especially if there is an underlying dysfunction within the AOS. Evolution has seen human beings develop from quadrupedal into bipedal creatures. This adaptation has allowed us to carry out tasks at a more advanced level than we would have done previously, however, has also brought about changing demands upon the body. This has meant that the body has had to adapt in order to cope with different stresses. With the transformation of humans into upright-functioning beings, the demand upon the posterior structures of the body has changed dramatically, and these have had to adapt accordingly. For example, the gluteus maximus has evolved from a relatively small muscle (as observed in chimpanzees) to being the largest muscle in the body. It has become part of a system which is specialised and integral in supporting functional control in movements such as human gait – the posterior oblique muscle sling (POS). This sling system consists of the latissimus dorsi (LD), the gluteus maximus (GM), and the inter-connecting thoracolumbar fascia (TLF). The POS, otherwise known as the back functional line, crosses approximately at the level of the sacro-lumbar junction. The lower portion of the sling, consisting of the distal GM fibres, passes underneath the iliotibial tract to attach to the posterolateral edge of the femur, thus this system becomes linked with the lateral sling. Within recent decades’ clinicians have begun to identify that stability is a complex phenomenon, and “a system of assisting movement whilst stabilising” exists. The POS is fundamental to this method of functioning. Image P1: The posterior oblique sling consists of the latissimus dorsi, contralateral gluteus maximus, and the inter-connecting thoraco-lumbar fascia. The role of the POS is most distinguished during the single support (stance) phase of gait. Prior to heel strike, the ipsilateral hamstring muscle contracts in order to prepare the limb for weight-bearing. During this, the proximal hamstring also carries the role of stabilising the ipsilateral pelvis against the activity of the quadriceps, in order to prevent excessive anterior rotation of the ilium. However, once heel strike occurs, hamstring activity diminishes and its role of limiting ilium movement is largely undertaken by the GM. At this point the muscle is in a lengthened position. Simultaneously, counter-rotation of the trunk also begins to takes place. During this process, the arm contra-lateral to the stance leg is ante-flexed, undergoing an eccentric contraction of the LD in order to control the forward momentum of the limb, whilst taking the LD also into a lengthened position. The propulsive phase of gait then follows, with both the GM and contralateral LD concentrically contracting from a lengthened to shortened position, resulting in extension of the arm with the opposite propelling leg. When these two simultaneously occurring mechanisms are coupled, a contraction of GM alongside its contralateral LD is observed. As discussed previously, this causes an increase in tension within the TLF, eliciting stabilisation of the SIJ and lumbar spine. This theory also adds credence to the remark that weakening of the GM aspect of the POS often results in hamstring dysfunction, due to the compensatory activity in order to stabilise the ilium. Image P2: Shows the direction of force created by the POS during gait. As well as the SIJ compressional stability that this system produces through the TLF, some authors also believe that the mechanism acts a ‘smart spring’, using phasic contractions to release and store energy during gait. Vleeming theorises that kinetic energy is built up in the GM and LD as they lengthen prior to and during heel strike, respectively. This energy is then released as these muscles shorten immediately following the lengthening phase, causing this kinetic energy to be released. A similar response is observed when a finger rapidly returns to a neutral position, when it is released following passive full extension. There is debate surrounding whether this kinetic energy is stored within the muscles or the TLF. Regardless of this, it is widely believed that this mechanism reduces energy expenditure of surrounding muscles of locomotion, thus reducing the metabolic cost of gait. As alluded to previously, it is vital that the muscle slings of the body function harmoniously in order to facilitate efficient movement and prevent injury. This is especially pertinent between the anterior oblique sling (AOS) and the POS. These systems can be viewed similarly to a muscle pair, with an antagonist and an agonist: whilst one is contracting, the other may work to control the movement being produced. An example of this in the AOS and POS is during the swing of a tennis racket. The movement and power is produced by the AOS which causes a rotation and forward movement of the pelvis, trunk and arm. However, the POS is also crucial during this action in order decelerate the movement when appropriate, using eccentric control. This helps to aid an individual in maintaining their balance during a highly dynamic movement such as this, whilst stabilising the lumbo-pelvic hip complex. Anatomically, the DLS connects the erector spinae, multifidus, thoracolumbar facia, sacrotuberous ligament and the biceps femoris. This sling allows for movement in the sagittal plane whilst simultaneously influencing local stability. The contraction of the muscles in this sling triggers a series of actions which encourage the SIJ into its stable closed packed position. In order to appreciate the influences of the DLS it is important to understand the terms nutation and counter nutation. Nutation is a flexion moment of the sacrum in relation to the iliac or posterior rotation of the iliac in relation to the sacrum. This motion will compress the posterior surface of the iliac bones to the sacrum – locking the structures together. The stable close packed position created through nutation will also increase tension in key ligamentous structures like the sacrotuberous, sacrospinous and interosseous ligaments. The increased tension enhances the anatomical function of the ligaments to further reinforce stability. Counter-nutation is the opposite of nutation and is said to be less stable in comparison. Image D1: The direction of force in the Deep Longitudinal Sling. The superficial erector spinae aponeurosis extends from the thoracic region to attach to the sacrum and ilium via a strong tendinous attachment. These attachments allow for trunk extension above lumbar level and compress the lumbar region as a result. In addition to this, the pull on the sacrum through the erector aponeurosis will also cause nutation, which stabilises the SIJ. The multifidus muscle also plays a role in this system. It has superficial fibres which attach to the spinous processes of the lumbar vertebra and this allows it to assist in extension. Meanwhile, due to angle of their anatomical attachment, the deeper fibres of the multifidus will contract to increase segmental stability through compression. Contraction of the sacral fibres of the multifidus will encourage also sacral nutation. Both the erector spinae and the multifidus muscles lay enclosed in a ‘fascial envelope’ created by the thoracolumbar fascia system. When these muscles contract they have a broadening effect (inflation of the fascial cylinder) which will further increase tension and assist with force closure. The biceps femoris forms the last part of this anatomy sling and contributes tension through the sacrotuberous ligament to create the counter nutation required to maintain balanced tensile forces and stability. Functionally, the DLS is required activate all day long as it includes postural muscles like the erector spinae but it can activate to a greater degree as required. As previously mentioned the muscles of this sling contribute to both movement and stability through their different fibres and attachments. Essentially this means that the sling will adjust stability in accordance with the activity being performed. This is because the body must instigate a higher level of stability in order to protect against sheer forces in the pelvis and prevent injury. When comparing two activities like returning to neutral after tying your shoe laces and whilst performing a deadlift, the sling will create more tension during the deadlift and this will result in increased lumbo-pelvic stability. ►Stretching or performing tissue release techniques like soft tissue massage biceps femoris or rector spinae. ►Manipulate or mobilise the offending structure. ►Restore normal muscle motor recruitment. The anatomy of the lateral sling consists of the gluteus medius, gluteus minimus, tensor fascia latae (TFL) and iliotibial band (ITB). The lateral sling begins at the origin of the gluteus medius and minimus on the external surface of the ilium, and ends at the insertion of the ITB on the upper tibia. This gives the lateral sling broad coverage of the lateral aspect of the hip and knee joint. 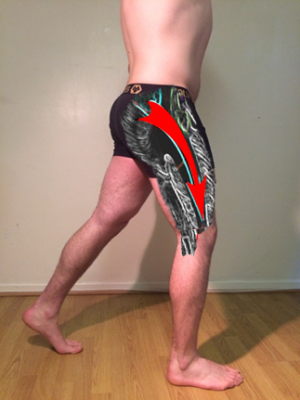 Image L1: The lateral sling consists of: gluteus medius, gluteus minimus, tensor fascia latae, iliotibial band. The lateral sling is used in coronal plane stability and is involved in pelvo-femoral stability in dynamic movements such as gait, lunges and stair climbing. In order to understand the relevance of the sling, the action of the muscles needs to be understood. The gluteus medius and minimus are hip abductors and medial rotators whilst the TFL works in synergy with these muscles to hold the pelvis level in single leg movements. Additionally, the TFL works with the gluteus maximus on the ITB to stabilise the hip joint by holding the head of the femur in the acetabulum. Functionally, the pelvic girdle should be neutral in all three planes: coronal, sagittal and transverse. During movements involving single leg stance, such as walking, the lateral sling comes into tension to maintain the pelvis stable over the stance leg, preventing pelvic drop on the opposite side of the pelvis. Failed control by the lateral sling often presents as a hip drop/ trendelenburg sign during stance phase of gait and single leg stance. 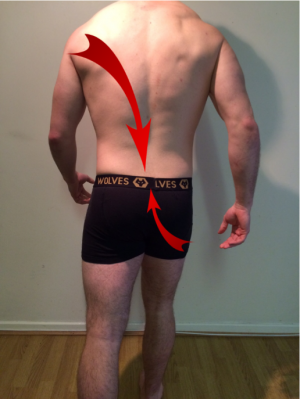 A compensation for a trendelenburg is to side flex the trunk to the affected side to maintain the level of the pelvis, and this is demonstrated in the image below. Maintaining a neutral pelvis is vital in correct alignment of the lower limb during movement; ensuring your hip lines up with your knee and knee lines up with your toes. This alignment allows the joints to be in their best functional positioning and allows the muscles to work in their optimal range. This ensures that the forces going through the region are distributed appropriately and not putting excessive strain on the structures. An example of a strengthening exercise for the lateral sling is a single leg squat. How Do These Link to Low Back Pain? Low back pain (LBP) is an extremely common condition with approximately 84% of the population developing LBP at some stage of their lives; 11-12% of the population being disabled by this pain. Additionally, 1/3 of the UK population will have one or more episodes of back pain each year, resulting in about 2.6 million people in the UK visiting their general practitioner annually. The most common cause of structural change in the passive system of the LPH complex is either following a large trauma, such as a car crash, or as a result of prolonged repetitive microtrauma. Lee (2011) argues dysfunctional slings and microtrauma are linked. If a dysfunctional sling is identified in a patient, this non-optimal strategy for transferring loads will be used on a daily basis. In the lumbar spine the non-optimal strategies fail to control angular and linear motions of the joints during movement and, according to O’Sullivan, this can be classified as motion control impairment. Clinically, this can often be seen when a patient ‘hinges’ at a lumbar spinal level during movement. This impairment creates excessive stress on the joints in the Lumbopelvic-hip (LPH) complex, in particularly the lumbar spine. In other words, when your lower back is not being supported effectively by the muscles, the lumbar spine is under more compression. The microtrauma associated with this can include synovitis of the facet joints, minor tears in the annulus and tears of the ligamentum flavum. Over time the repeated microtrauma leads to significant pathoanatomical changes including; weakening of segmental ligaments, loss of articular cartilage of facet joints, loss of disk height, disk herniation and sclerosis of vertebral bodies. A combination of the above changes often results in lower back pain. The sacroiliac joint (SIJ) is another structure affected by altered transfer of forces. Repetitive shear forces caused by the non-optimal movement strategies may result in sclerotic changes on both the sacral and iliac surfaces. Consequently, this degeneration may also be a source of lower back pain. On the other hand structural changes do not always cause pain; this being demonstrated in many asymptomatic people with abnormal radiological imaging. Radiological findings therefore must be interpreted with caution and the clinical significance considered. Increased activity of both superficial trunk flexors and extensors (co-contraction bracing). Increased activity of the superficial trunk flexors (chest gripping). Increased activity of the superficial trunk extensors (back gripping). Failure of the superficial trunk extensors to relax during forward bending. 1. A pre-existing non-optimal strategy and load transfer, leading to lower back pain. In pre-existing non-optimal strategies, impaired activity of the deep muscle system could lead to the body using less efficient superficial muscles for stability of the spine- the patient will therefore overly rely on the superficial slings. Additionally, if a superficial sling is weak, other slings may have to increase activity to compensate for this weakness. In patients who experience an acute trauma, a guarding response can often be seen as the body tries to prevent further tissue damage. This is seen clinically as co-contraction of the trunk muscles or ‘bracing’, which prevents movements that agitate pain whilst also increasing spinal stability. Once this bracing posture is adopted, some patients find it difficult to return to ‘normal’ movement so they continue these dysfunctional movements. This can consequently lead to an acute problem becoming chronic and recurrent . LBP can also have an effect on the neurological function of the stabilising musculature. LBP is thought to delay muscular reflexes in key muscles around the lumbo-pelvic complex and this could compromise their ability to rapidly stabilise the region in response to sudden loads. This delay in stabilisation could leave an individual exposed to injury or an exacerbation of any injury already present. For example, failure to meet the volatile demands of sport could leave structural segments unstable and exposed to further damage. In conclusion, the information presented on this wiki page begins to build a case for a more comprehensive approach to LBP assessments. Although very limited at present, the literature available supports the existence of anatomical slings and the vital role they have in stabilising the lumbo-pelvic complex. All physiotherapists should be aware of the anatomical links between the structures of the various slings and the ways in which they work in synergy to influence lumbo-pelvic stability. A different perspective of 'core stability' can be developed with an understanding of how local structures are stabilised by these global systems. Unfortunately, this wiki page is limited by the lack of clinical research investigating the anatomical slings and their function in relation to LBP. However, the authors hope that the information presented is able to encourage a consideration for a multi structure; multi intensity movement assessment and a consideration for the whole sling system as opposed to a single muscle during treatment. ↑ 2.00 2.01 2.02 2.03 2.04 2.05 2.06 2.07 2.08 2.09 2.10 2.11 2.12 2.13 2.14 2.15 2.16 2.17 2.18 Lee, D; Vleeming, A; Jones, M. The Pelvic Girdle: An Integration of Clinical Expertise and Research. Edinburgh: Elsevier/Churchill Livingstone, 2011. ↑ 3.0 3.1 Hoffman, J; Gabel, P. Expanding Panjabi’s stability model to express movement: A theoretical model. Medical Hypotheses, Volume 80, 2013. Pages 692-697. ↑ 4.0 4.1 4.2 Panjabi, M. The stabilizing system of the spine. Part I. Function, dysfunction, adaptation, and enhancement. Journal of Spinal Disorders, Volume 5, Issue 4, 1992. Pages 383-389. ↑ Norris, C. Back Stability: Integrating Science and Therapy, Second Edition. USA: Human Kinetics, 2008. ↑ 6.0 6.1 Reeves, P; Narendrac, K; Cholewicki, J. Spine stability: the six blind men and the elephant. Clinical Biomechanics. Bristol, Avon, Volume 22, Issue 3, 2007. Pages 266-274. ↑ Richardson, CA; Snijders, CJ; Hides, JA; Damen, L; Pas, MS; Storm, J. The relation between the transversus abdominis muscles, sacroiliac joint mechanics, and low back pain. Spine, Volume 27, Issue 4; 2002. Pages 399-405. ↑ Currie, S; Myers, C; Davidson, B; Enebo, B. Anticipatory Activation of the Erector Spinar and Multifidus in Patients With and Without Low Back Pain. Pain Journal, Volume 74, Issue 33, 2012. Pages 64-65. ↑ Brown S and McGill SM. Transmission of muscularly generated force and stiffness between layers of the rat abdominal wall. Journal of the Spine, Volume 34, 2009. ↑ 11.0 11.1 11.2 11.3 11.4 Chek, P. Core Stability: The Outer Unit. International Association of Athletics Federations, NSA 1-2.00, 2011. ↑ Basmajian, JV. Muscles Alive: Their Functions Revealed by Electromyography, Second Edition. Baltimore,: Williams & Wilkins, 1967. ↑ Vleeming, A; Schuenke, M; Masi, A; Carreiro, J; Danneels, L; Willard, F. The sacroiliac joint: an overview of its anatomy, function and potential clinical implications. Journal of Anatomy, Volume 221, Issue 6, 2012. Pages 537-567. ↑ 16.0 16.1 Myers, T. Anatomy Trains, Third Edition. UK: Churchill Livingstone, 2013. ↑ Vleeming, A; Pool-Goudzwaard, AL; Stoeckart, R; van Wingerden, JP; Snijders, CJ. The posterior layer of the thoracolumbar fascia. Its function in load transfer from spine to legs. Spine Journal, Volume 20, Issue 7, 1995. Pages 753-758. ↑ Dorman, T. Storage and Release of Elastic Energy in the Pelvis, Dysfunction, Diagnosis, and Treatment. Journal of Orthopaedic Medicine, Volume 14, 1992. Pages 54-62. ↑ Nickelston, P. Dynamic Activation of the Posterior Oblique Chain: The Reverse Lunge. Dynamic Chiropractic, Volume 31, Issue 9, 2013. ↑ Myers, TLW; Maizels, D; Wilson, P; and Chambers, G. Anatomy trains: Myofascial meridians for manual and movement therapists, Second Edition. Edinburgh: Elsevier Health Sciences, 2008. ↑ 23.0 23.1 23.2 Comerford, M. and Mottram, S. Kinetic control. Australia : Elsevier Australia, 2012. ↑ 24.0 24.1 Neumann, D. A. and Kelly, ER. Kinesiology of the musculoskeletal system: Foundations for rehabilitation. Second Edition. United States: Elsevier Health Sciences, 2009. ↑ 25.0 25.1 25.2 Drake, R; Vogl, W; Mitchell, A. Gray’s Anatomy for Students, Third Edition. London: Churchill Livingstone, 2015. ↑ Balagué, F; Mannion, AF; Pellisé, F; Cedraschi, C. Non-Specific Low Back Pain. The Lancet, 379(9814), 2012. Pages 482-491. ↑ National Institute for Health and Clinical Excellence (NICE). Low back pain: early management of persistent non-specific low back pain. Clinical Guidelines, 2009. ↑ Pinheiro-Franco, J; Vaccaro, A; Benzel, E; Mayer, H. Advanced concepts in lumbar degenerative disk disease. Rio de Janeiro: Dilivros Editora Ltda, 2010. ↑ O’Sullivan, P. Diagnosis and classification of chronic lower back pain disorders: maladaptive movement and motor control impairments as underlying mechanism. Journal of Manual Therapy, Volume 10, Issue 4, 2005. Pages 242-255. ↑ Chou, R. Deyo, R. Jarvik, J. Appropriate use of lumbar imaging for evaluation of low back pain. Radiological Clinics, Volume 50, Issue 4, 2012. Pages 569-585. ↑ 33.0 33.1 Hodges, PW; Cholewicki, J. Functional Control of the Spine. In: Vleeming, A., Mooney, V. and Stockhart, R. Movement, Stability and Lumbopelvic Pain: Integration of Research and Therapy, Second Edition. Edinburgh: Churchill Livingstone, 2007. ↑ Yap, E. Myofascial Pain- An Overview. Annals-Academy of Medicine Singapore, Volume 36(1), 2007. Page 43. ↑ Huxel Bliven, KC; and Anderson, BE. Core stability training for injury prevention, Sports Health: A Multidisciplinary Approach, Volume 5(6), 2013. Pages 514–522.